Rinse off the chicken, pat dry, and season with salt and pepper. Heat a heavy saucepan over moderately high heat, add the oil and when hot, place the chicken pieces, skin side down, in the skillet and fry for 5 minutes or until browned. Turn the pieces and brown on the other side. Remove the chicken and keep warm. Pour off all but 1 tablespoon of the fat from the skillet. Add the onion to the pan and saute until it is softened. Add the ginger and garlic and cook for an additional couple of minutes. Stir in the ras el hanout, lemon zest, and flour. Cook for 1 to 2 minutes, stirring constantly to cook the flour. Whisk in the broth, raise the heat, and scrape all the bits and pieces from the bottom of the pan into the sauce. Add the lemon juice and honey. Reduce the heat, return the chicken pieces to the pan, and simmer, uncovered, stirring occasionally, for 30 to 40 minutes or until the chicken is just done. Add the chickpeas and olives and simmer for 5 minutes. Taste and adjust the seasonings. 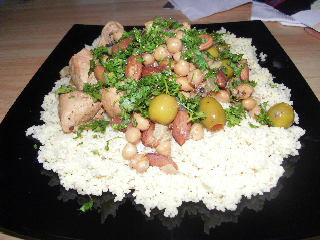 To serve, create bed of couscous or rice on a large platter, place the chicken pieces on top, and pour the sauce over the chicken. Garnish with the parsley and lemon peel.